Acclaimed by travel writers and TripAdvisor as one of the best spots in the world for snorkeling, Belize is generally busy in the north and sleepy in the south. It boasts hundreds of cayes and atolls plus a healthy 185-mile stretch of barrier reef. There are loads of sites for snorkeling in Belize, all easily accessible for all experience levels. Half or whole day tours usually involve a calm, two-hour boat ride. Alternatively, live-aboard boats offer week-long trips with two or three dives daily, including nighttime. Ambergris Caye, only a two-hour flight from Houston, Texas, appears on every list of top snorkeling spots in Belize. Here you will find some of the cleanest white beaches and crystal clear water anywhere on the planet. The coral reef is a short swim from the beach, making this one of the few places to snorkel in Belize that you don’t need a boat to get to. It is very secluded and feels like a private island. Civilization, if you need it, is accessible via a daily boat ride into town. Hol Chan Marine Reserve. The country’s largest caye, Hol Chan and neighboring Shark-Ray Alley are among the top spots for diving and snorkeling in Belize. You may have to grin and bear the crowds, but, not far from the surface, it is teeming with wildlife and spectacular underwater views and is worth the minor inconvenience of having to share. Travel writer Amy ‘don’t touch the coral’ Truong loved the place. Swim with curious sea turtles. Perfect for newcomers to the sport. Lighthouse Reef and the Blue Hole. Located 50 miles out past the barrier reef into the ocean, Lighthouse Reef is the outermost atoll from Belize. 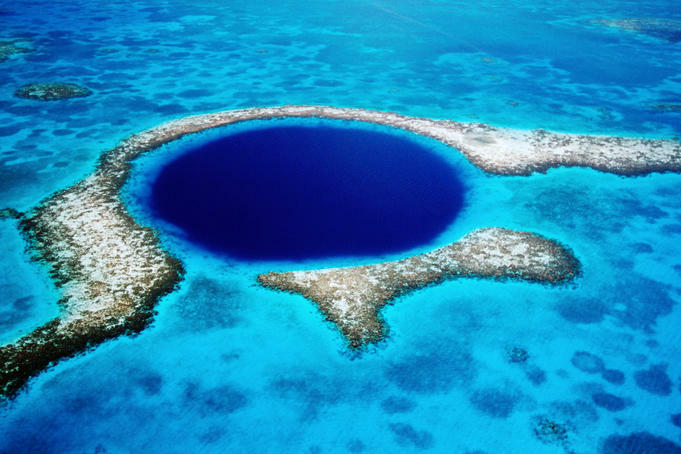 Made famous by the Blue Hole, an exquisitely round reef with a diameter of approximately 1,000 feet. The reef encircles a 400-foot deep hole. Mexico Rocks. One of my favorite spot to snorkel is Mexico Rocks. It is a short 15 to 20 minutes boat ride from San Pedro, Ambergris Caye, in the northern section of the island. Unlike other snorkeling spots near the barrier reef, Mexico Rocks is a coral patch located in the shallow waters between the reef and the island. It is a protected area for wildlife and since the area is inside the reef, you won’t feel the ocean swells, making it a perfect snorkeling spot for any beginners. A lot of snorkelers like Lighthouse Reef. It has a shallow shelf of healthy coral populated with an impressive range of invertebrates. The sea floor drops almost vertically, which is why the water is such a deep blue, and there is very little sea life on the walls. If you’ve got kids, a bad back, or you are looking for a tranquil experience, avoid Lighthouse Reef. If you are after a seafaring adventure, don’t mind getting tossed around on a boat for three hours and you simply must go home with photographic evidence that you have been to this iconic diving spot, then join the hardy souls who have been there before you and go for it. Whether you are new to snorkeling or an old hand at it, you won’t be sorry you visited Belize, one of the top spots in the world for diving and snorkeling. While you’re here, do try a night dive. It’s a completely different world, offering bioluminescent sea life, sleepy parrotfish and glowing green moray eels. If you want to experience Belize for yourself, then get in touch with Travel Belize now, the authority on travel, tourism, excursions, real estate, and more in Belize. Belize is the destination of endless possibilities, and we will be your guides on this tropical journey.